Save time using department policy and procedure manuals. Imagine Your Company Policies and Procedures Manual — DONE! Save time by downloading easily editable MS-Word policies and procedures manual template files — customize them for your company. Use standard best practices to save yourself hundreds of hours of researching, writing and editing. Each policy procedure manual template provides clear procedure format examples. Edit standard business process templates to improve company consistency. 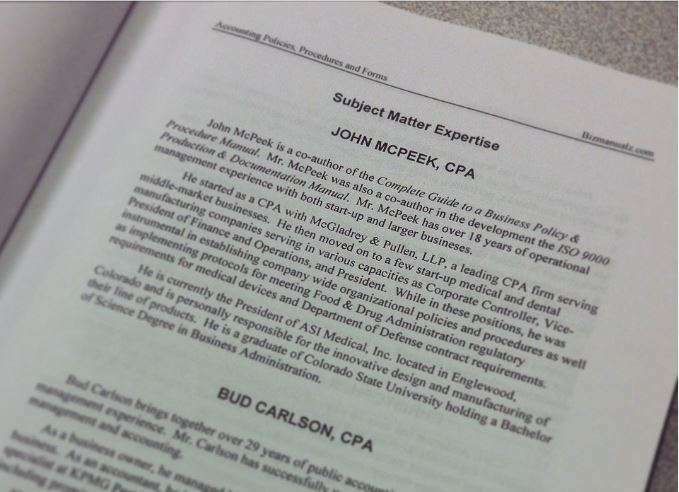 Realize the benefits of pre-written procedures as a reference tool. 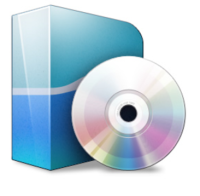 Select your manual solution, Download, edit, done! Yes, it’s that simple. Protect your business assets with easily editable internal controls, policies, and procedures Accounting Manual. 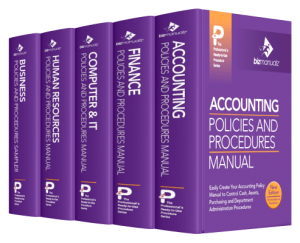 Define accounting policies and procedure methods for revenue, cash, purchasing, G&A, inventory and assets. Includes over three dozen Accounting procedures for cash, inventory & assets, purchasing, revenue, and administration. 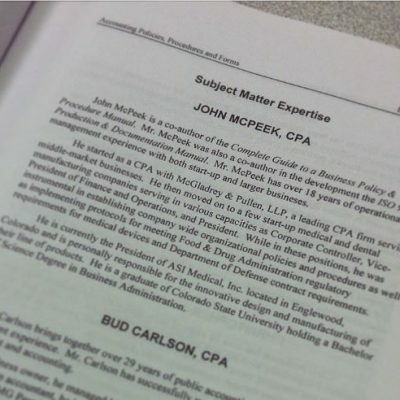 Also contains an Accounting Policy Manual, a policy for every procedure, and an Embezzlement Prevention guide. Establish strong financial auditing and control to manage your company’s capital with a Finance Manual. Quickly create a financial management system to manage risk, optimize returns, and establish effective internal controls. Includes dozens of Finance procedures for administration, financial statements, internal controls, raising capital, and treasury management. Also includes a Finance Policy Manual, a policy for every procedure, and a business management guide. Protect and control your IT assets with easily editable information technology policies and procedures manual. Use best practices to manage IT security, technology assets, software projects, and IT management. Includes procedures for IT administration, IT training and support, IT asset management, IT security disaster recovery, and software development. Plus, an IT Policy Manual, a policy for every procedure, and IT security guide. Set human resource employee policies for conduct, compliance, and job performance. Reduce exposure to employee liability issues with easily editable HR policies and procedures. Includes human resource procedures for administration, employee hiring, compensation, payroll, training development, and HR compliance. Also includes sample job descriptions, a Human Resource Policy Manual, a policy for every procedure, and an Employee Handbook. Drive customer satisfaction with improved strategies and tactics. Design effective sales processes, marketing tactics, company strategy, and product management with a Sales and Marketing Manual. Includes Sales and Marketing policies and procedures for planning strategy, tactics, sales, administration, and product management. Also contains a Sales & Marketing Policy Manual, a policy for every procedure, and an Internet Marketing guide. Quickly create your own ISO 9001 quality management system with easily editable quality policies and procedures. Drive document and record control, Nonconformance management, Corrective and Preventive Management, and Internal Auditing. Includes ISO Training introduction, quality procedures, quality forms, ISO Implementation, and a sample ISO Quality Manual (both long and minimal requirements versions). Save up to 45% with Special Offers on collections of editable Standard Operating Procedures (SOP) Manual Templates in Microsoft Word! 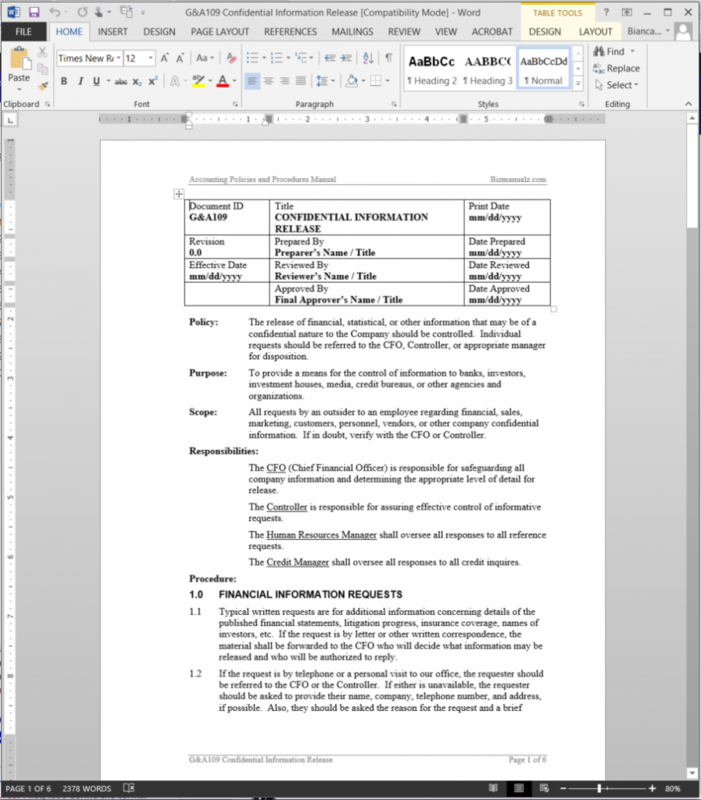 Download standard work instruction content for key business processes in your company. Click on each business policies procedures manual template solution for more information on the specific procedure templates included. Standardize company operations and methods using a sampling of 100 procedures from various SOP manual. 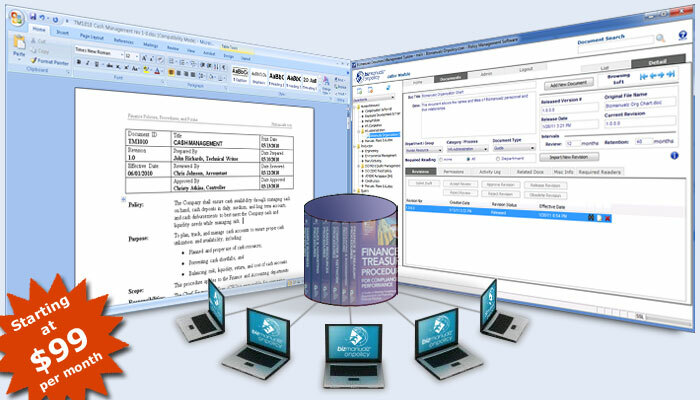 Select the finest MS-Word financial policy procedure manuals to administrate your company. SAVE 35% when you use the 5-manual CFO bundle to model core HR, IT, accounting and financial operations. SAVE 45% when you download the 9-manual bundle to implement SOP best practices in each department. Automate your policies procedures manual template workflow, document management, and reader acknowledgement with an easy online interface to manage, control and share your important documents over the web. Fast, simple access to all of your policy documents. The finest selection of MS-Word policies procedures manual template files, forms and job descriptions for key business functions. Find what you need now! 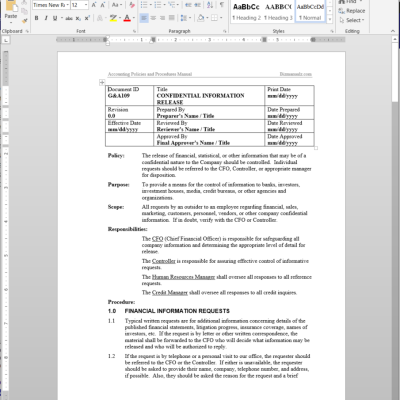 Easy-to-edit policy and procedure Word document templates. Standard work instructions are available for instant download. Start using them now! Download Free Sample policies procedures manual template Word documents to experience how each department manual is easy to edit and use for your company. Download your procedure manual now! Change any of the text, add your own procedure content, and customize Word document templates to fit your company policies. 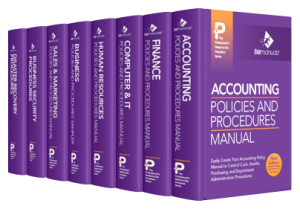 Handy starting point – No need to start your policies procedures manual from scratch! Word SOP Templates are pre-formatted with a header block and include Purpose, Scope, Job Description Responsibilities, Revisions, and more. “We are a new company and there were many forms and procedures that we did not have a clear idea how to write. Human Resources Policies Procedures Manual has proved to be a wonderful help to our new company!”. Comprised of professionally researched business policy procedure content. Written in line with Business Best Practices. Produced by a company with over 20 years of Lean, ISO, business process improvement experience.